Seems like there’s a sense of change in the proverbial air over at Delta: in advance of the airline’s introduction on July 1, 2014 of new BusinessElite and Economy seats aboard its 757-200s for JFK-LAX routes, the airline announced today that they’ve just completed updates to the BusinessElite cabins on their A330-200/300s, Boeing 767-300ERs and 400ERs, 747-400s and 777-200ERs and LRs, and claims this makes them the only US carrier to offer full lie-flat seats with direct-aisle access in business class on all wide-body international flights. That’s quite a qualified first, since United claimed a similar honor back in June when it announced the revamp of all its international long-haul aircraft with 180-degree flatbed seats. However, it’s still a good step in the right direction for Delta, and certainly something worth celebrating. A330’s and 747-400’s: Reverse herringbone 1 x 2 x 1 configurationwith direct aisle access and 15.4” monitor for seatback entertainment and 82 inches of pitch, 20.5 inches wide on the 747, 80 inches by 21 inches on the A330. The BusinessElite seats that Delta will now employ on its 757s for transatlantic routes are 21 inches wide with an 80-inch, lie-flat pitch, arranged in a 2 x 2 configuration with all-aisle access, as well as 16″ in-seat touchscreen monitors with on-demand entertainment. 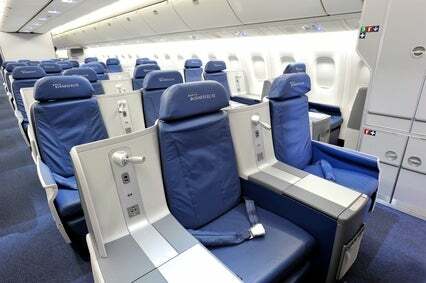 BusinessElite seats on Delta’s A330’s. Updates to both BusinessElite and Economy seats on Delta’s long-haul flights include personal, on-demand entertainment systems at every seat, Westin Heavenly in-flight bedding in BusinessElite, and new amenity kits in both BusinessElite and international Economy. The latter is a sleep kit that includes an eye mask and ear plugs. Interior updates to 225 of Delta’s domestic narrow-body aircraft, including the addition of more baggage space and access to power, will continue through 2016. Delta’s completion of this upgrade to its BusinessElite seats in particular puts Delta ahead of American Airlines, which is already in the process of making improvements to its present international business-class service and slowly beginning to roll out updates to its 767-300s with an all-new international business class. 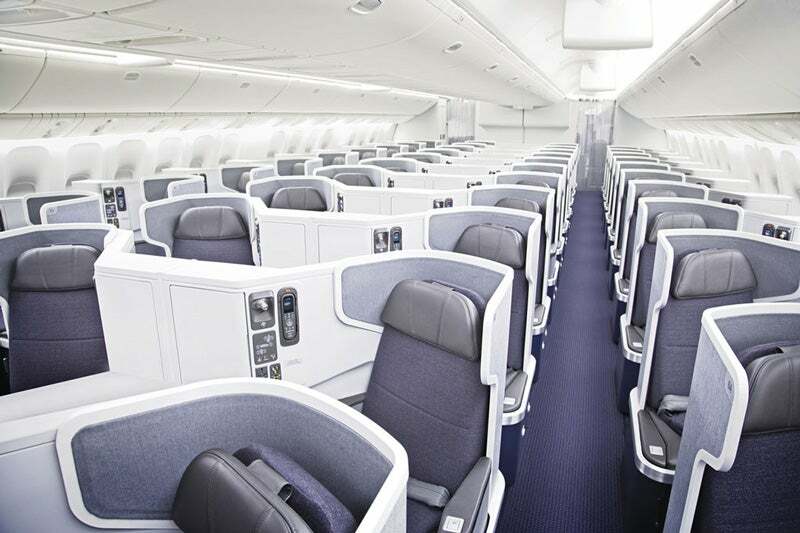 The new American 767-300 business class cabin. 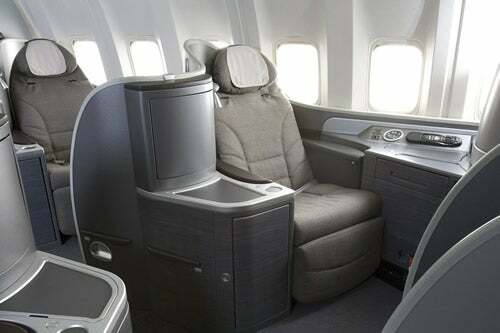 However, this new version of business class on the 767-300 has has 26-inch-wide lie-flat seats in a 1 x 2 x 1 staggered configuration with all-aisle access is only being rolled out starting this month on the JFK-Zurich route. The cabin will have a total of 28 seats in 7 rows and the new seats will be fully horizontal lie-flats without IFE screens. American has plans to retrofit about half of the 58 767-300′s in its fleet now through the end of 2015, and to retire the rest as it replaces them with current-generation aircraft like the A321. 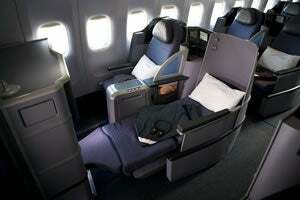 American’s flagship new business class is already available on some international routes on the 777-300ER. The 52 business class seats are arranged in a 1 x 2 x 1 herringbone pattern, and each seat is 26 inches wide with a lie-flat pitch of 75-76 inches and the same 17-inch personal screen, Wifi and power offerings as in the Flagship Suites. The planes’ present routes are JFK, LAX, MIA and DFW to London Heathrow (LHR), as well as from JFK and DFW to Sao Paolo (GRU); this summer, they’ll introduce a DFW to Hong Kong (HKG) route, and in November, MIA-GRU. American’s fleet of 777-300 ER’s also offer the airline’s new Flagship First Class Suites, as well as the upgraded business class product. The plane’s 8 Flagship Suites are configured in a two-row 1 x 2 1 herringbone pattern with direct-aisle access, and each seat is 29 inches wide, has 80 inches in pitch with a full lie-flat length of 6’8″, and features a 17-inch personal entertainment screen, international Wifi capability, universal AC power outlet and USB jack. Turn-down service includes a mattress, comforter and light blanket, and seats are are left open to the aisle, without any enclosures. 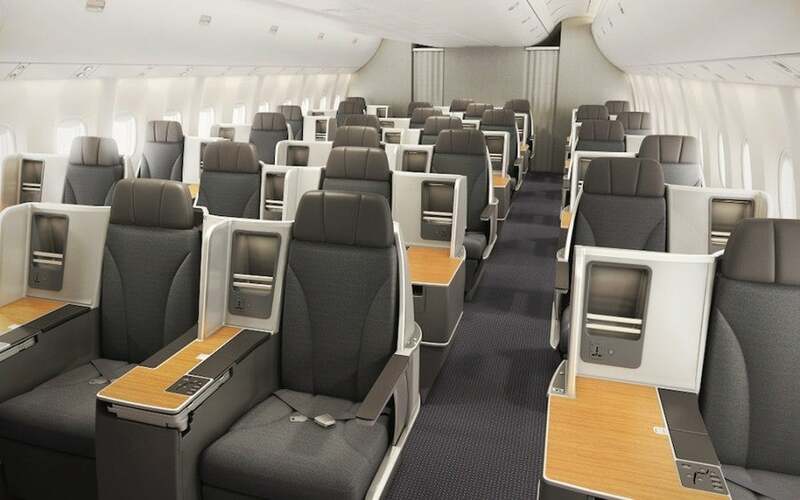 Later this year, American will begin retrofitting its international-service 777-200’s with two-class configurations of business class and economy seating. 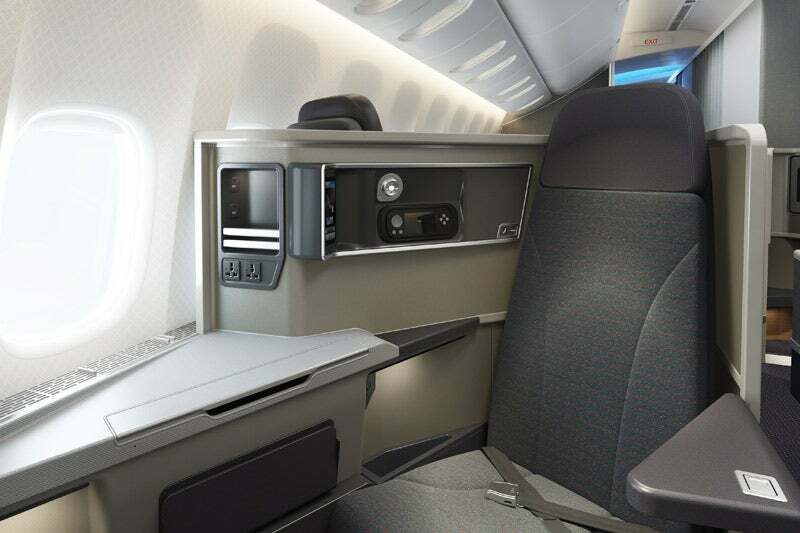 The adjustable front- and rear-facing 6’4.5″ lie-flat business-class seats will have all-aisle access, and the Main Cabin Extra seats will each have with six more inches of legroom than the regular economy seats. Both classes will feature personal entertainment systems and international WiFi. In January this year, United finally completed an overhaul of their entire fleet of 757 p.s. (Premier Service) planes that only travel coast-to-coast between JFK and both LAX and SFO. Each p.s. 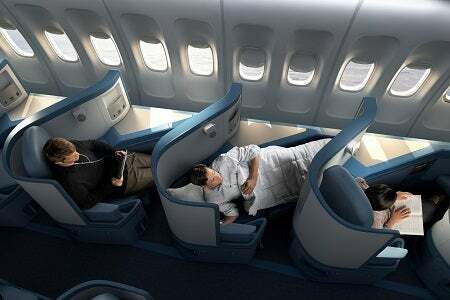 plane now offers a BusinessFirst class (a combination of Business and First classes) with 28 seats that are 180-degree flat-bed with 6’4” of space when fully extended, and have 15.4-inch entertainment monitors. First class was phased out on these aircraft. United also long lagged in terms of premium international cabins, but it’s been trying to make up for lost time. 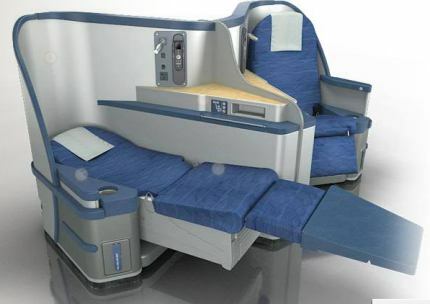 As we stated above, over the summer, it announced it had installed all flab-bed seats on 183 international long-haul aircraft operating on all scheduled international long-haul flights from its eight North American hubs and between Seattle and Tokyo Narita. The newly retrofitted cabins include revamped GlobalFirst and BusinessFirst cabins with over 7,000 flat-bed seats total fleetwide. GlobalFirst is the airline’s flagship first class suite. Seats are arranged in a 1 x 2 x 1 configuration with the outer seats facing outward towards the windows and the seats in the middle row of two facing each other (on the 767, it’s 1 x 1 x 1). Each Suite includes a gray fabric lie-flat seat that reclines to 6 feet 6 inches (almost long enough for me) with a duvet and pillow for sleeping, and a BackCycler lumbar support system. Each seat has its own 15.4-inch video monitor, laptop power source, and USB charging ports (except for some 777s). GlobalFirst seats are 6’6” when fully reclined to 180 degrees and are 22-23 inches wide. BusinessFirst is the airline’s flagship business class product and is based on the premium offerings Continental used to have. United’s planes configure these seats in a variety of ways ranging from 2 x 1 x 2 on the 767-400s to 2 x 4 x 2 on the 747 (2 x 2 on the upper deck) and most 777-200s (though some old Continental planes have them in a 2 x 2 x 2), so check out your aircraft’s seat map. Passengers get amenity kits, duvets and pillows, and the seats recline to a full 180 degrees. Seats have 76 inches of pitch when fully reclined and are 20 inches wide. Each has a 15.4-inch video monitor with programming controlled by the passenger, as well as a laptop power source and a USB port. Just note, there are a couple versions of various aircraft such as the 767-300s the airline flies to Europe where some have a GlobalFirst cabin and some do not, and where the BusinessFirst cabin has rows of either 5 or 6 seats across, so it pays to look at your particular aircraft’s seatmap to see how crowded you’ll be. There are also 3 versions of the 777 according to United’s aircraft page where there are old first class seats and no GlobalFirst or BusinessFirst. That said, the airline is trying to retrofit these quickly and nearly all of the airline’s 777-200s are converted already. United’s 787’s only have BusinessFirst, not GlobalFirst. The airline’s Boeing 787’s all have BusinessFirst cabins but no GlobalFirst onboard. US Airways’s Envoy Suite was designed to compete with the latest business class offerings on major international airlines (even the likes of Cathay Pacific Business class, which has the same seats), and is available on the airline’s entire fleet of A330-200s and A330-300s, which operate on almost all flights between the US and various European destinations including London Heathrow and Gatwick, Paris, Madrid, Frankfurt, Munich, Manchester, Rome and Tel Aviv. Just beware, although the airline’s 767 list their business class cabin Envoy as well, the seats in it are angled lie-flats, and not totally horizontal like they are on the Airbuses. A330-300’s have 28 seats in a 1 x 2 x 1 configuration while A330-200s have just 20 of these seats. The seats along the fuselage are angled out, while the two seats in the middle row are angled slightly toward each other in a reverse herringbone configuration. Envoy Suite seats recline between 76-80 inches depending on the seat’s location in the cabin. Each is also 20.5 inches wide (25 inches with the armrests down), and recline to a full 180 degrees. The touch-screen entertainment systems are older and smaller than the other legacies listed on here at just 12.1 inches wide, but seats also have 10-volt universal power outlets and USB ports to plug in your gadgets. 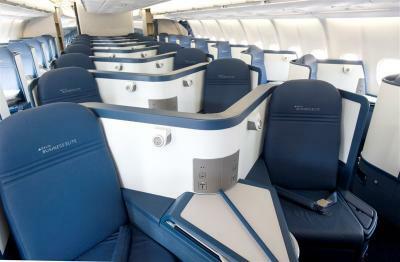 The 18 Envoy seats on the 767 are in a 2 x 2 x 2 configuration and only recline to 170 degrees with a pitch of 62 inches. They are also 20.5 inches wide, and flight attendants pass out Samsung Galaxy Tabs with 10.1-inch screens for in-flight entertainment. 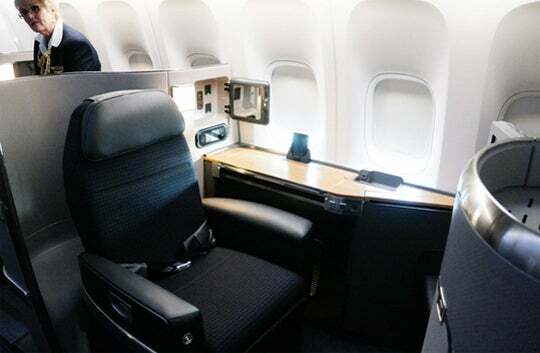 The airline’s 757’s are equipped with 12 old-school business class recliner seats in a 2 x 2 configuration with 60 inches of pitch, 19.5 inches wide and a recline of up to 160 degrees. IFE is provided on Samsung Galaxy tabs on these too. So that’s the current state of affairs on the major US airlines and their international business and first class products. What have you flown lately, and what do you prefer?